Microsoft has updated its ultra-simple Notepad app for Windows with a bunch of new features. The app that has been a part of Windows platform since its first version debuted back in 1985 has received the ability to zoom into text. There is also the wrap-around find and replace option and an upgraded status bar with line and column numbers. The new Notepad features are a part of the Windows update that is currently codenamed Redstone 5. It is already being released for Windows Insiders in the Fast ring in the form of Windows 10 Insider Preview Build 17713, though a similar experience will debut for the masses sometime later this year. 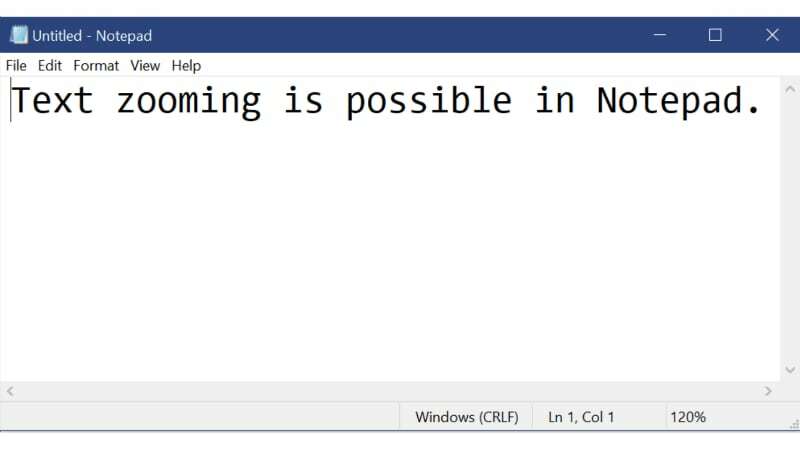 Notably, Microsoft back in May announced another important Notepad update that brought support for Unix, Linux, and macOS line endings. It is also so far available for Windows Insiders. Among other new features, the updated Notepad app includes an option to do wrap-around find and replace. Users can also leverage the new zoom support to magnify the text by holding down the Ctrl key and scrolling the mouse wheel to zoom in or out. The current zoom level is available in the status bar that is now visible by default at the bottom of the Notepad app. Furthermore, you can use the Ctrl + 0 combination to restore the zoom level to default. If zooming the text is not of your interest, the updated Notepad app now shows line and column numbers in the status bar when word-wrap is enabled. While the status bar is enabled by default to show you the line and column numbers and other information, you can turn it off by going to the View menu. The performance when opening large files in Notepad has also been improved. Plus, specifically to ease editing of long-length drafts, Microsoft has brought the Ctrl + Backspace support to delete the previous word entirely. Notepad has included support for arrow keys to unselect text first and then move the cursor. Further, the now lets arrow keys correctly unselect text first and then move the cursor. As we mentioned, the new changes in Notepad are initially available for Windows Insiders through the latest Windows 10 Insider Preview. Microsoft, however, previously brought the extended line endings. A recent Windows 10 Insider Preview also included a Search with Bing option in Edit menu to let users easily make new searches using Bing.